Made from rigid polypropylene with ratchet head harness. Browguard Only. Suits either the J.. 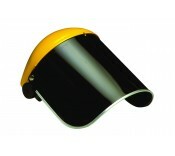 This polycarbonate face visor is primary used to protect the wearer against flying particles, giv..
Protection against low energy high speed particles and liquid droplets. The optical qulaities c..
Protection against liquid splash, impact protection and the shade 5 lens will protect against gas..